Typically, I have plenty of time to study the menu on the wall at Il Vicino. That’s because the line is long enough that I can read through the descriptions of pizzas and other offerings while waiting to place my order at the counter. Recently, however, there was no line, so even though there was no pressure to make a quick decision, I felt uneasy. I worried that people aren’t frequenting this gourmet pizza place like they should. The small eatery offers more than dozen types of pizza, several calzones and Panini, salads and a few pasta dishes. From a traditional Margherita to pies with roasted chicken, tuna, even spicy shrimp. It’s often difficult to decide. Even with no one in line behind us I was torn. We eventually settled on two salad/pizza combinations. 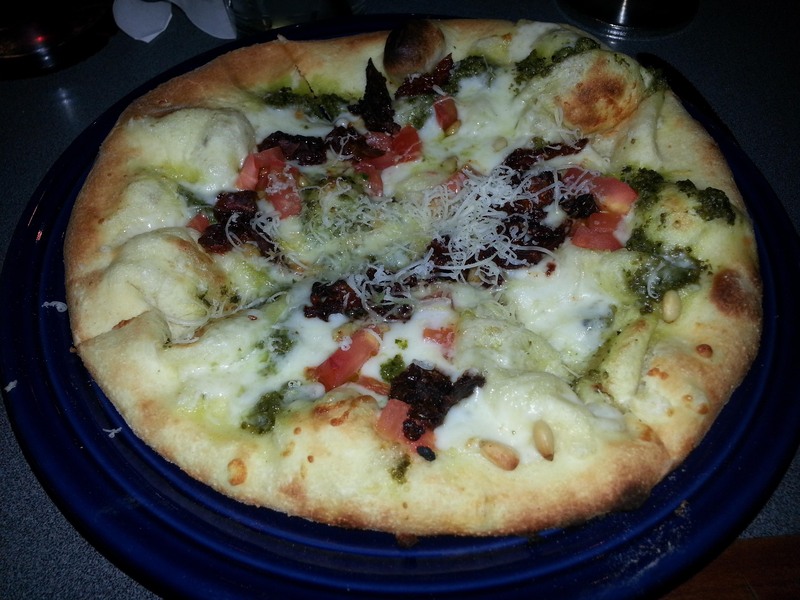 The Pizza al Pesto is embellished with fresh pesto, sun-dried and fresh tomatoes, pine nuts and mozzarella. The bread-like crust was thick with wood-smoked flavor. 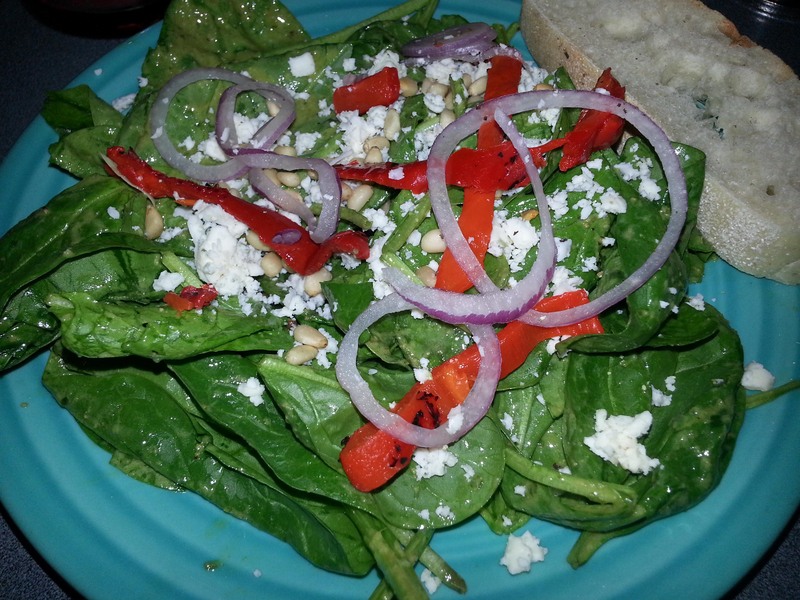 The Spinach Salad was the perfect complement with a fresh pesto dressing, roasted red peppers, red onions, pine nuts and Gorgonzola cheese over a bed of spinach. The other combination included the Campagnola: a traditional marinara, sausage, mushrooms, and, instead of goat cheese, Asiago cheese. The sausage stood out in the crowd of ingredients. The beautifully-plated Insalata Il Vicino was a rift on a Cobb Salad with rows of chopped roasted chicken, diced egg, Gorgonzola, artichoke hearts and walnuts. While leaving, the line in front of the menu board began to back up. Whew!